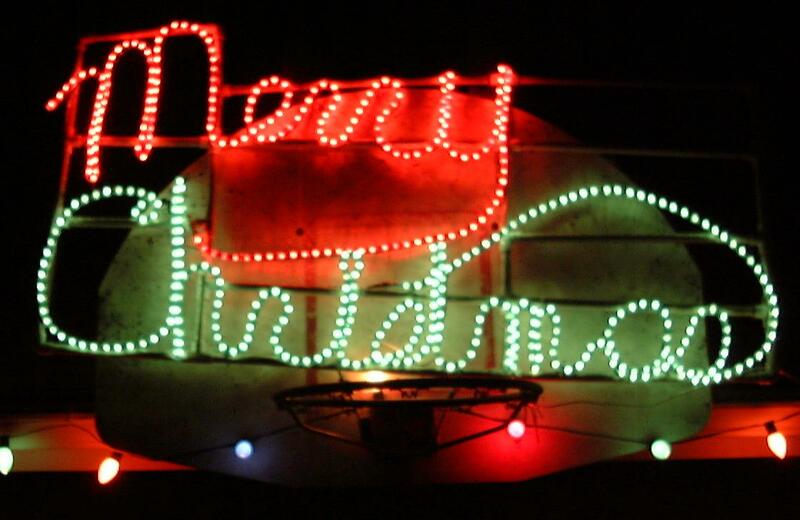 I’ve always liked the idea of including a Merry Christmas sign in Christmas displays. I much prefer them to the generic “Seasons Greetings” or “Happy Holidays” signs (see the Why We Decorate page for more of our feelings on this). Long before the large computer controlled Merry Christmas sign seen in our display came the original version of the rope light Merry Christmas sign seen to the left. I made this sign in 1992 as a gift for my parents. The original version used a frame made of wood dowels, with Merry Christmas spelled out in cursive made out of green clothesline wire, which I shaped myself and secured to the wood frame with thin-gauge utility wire. Since rope light was not common in 1992, I used regular mini-lights, which I secured to the clothesline with a combination of wire ties and tape. The original version had every other letter alternating red and green. This was because using mini-lights, it turned out to be difficult to read the sign when I originally did it up with the color scheme shown above. Therefore, Dad and I had a fun evening of “bulb switcharoo” which made the sign more readable. As you can see, the result is attractive and readable, and brings back my originally-intended color scheme. It made a really nice feature as part of Mom’s display for decades.